BOSTON, Mass. – A lot has happened over the last 80-plus years in the annual clash between Mansfield and Foxboro football. But the storied rivalry between the Hornets and Warriors has never had a game like Tuesday night’s contest at Fenway Park. Foxboro outlasted Mansfield, 35-33, in triple overtime on the historic field inside Fenway Park — the first overtime game in series history. “It doesn’t get much better than this,” said longtime Foxboro head coach Jack Martinelli. “Our kids going in as the underdog, they played harder than I’ve ever seen them play and I’m proud of them all. After being limited to six points through the first three quarters, Foxboro scored four times between the fourth quarter and three overtime periods. On the flip side, Mansfield orchestrated a game-tying drive over the final 2:32, driving 63 yards before tying the game with just two seconds left. After the teams remained tied through two overtime periods, Foxboro was able to make one final stop to secure the win. The Warriors started on offense in the third overtime and found the end zone on second down. Senior quarterback Liam Foley (10-for-17, 165 yards, three touchdowns) hit classmate Mike Luong in the flat for a 9-yard touchdown. Foley rolled right then threw back across his body to an open Rob Fay for the two point conversion and a 35-27 lead. Mansfield punched it in on third down on a carry from sophomore Cincere Gill (12 carries, 104 yards) from three yards out to make it 35-33. Gill dove into the pylon on the two-point attempt but Mansfield was called for holding and had to attempt the two-point conversion from the 13-yard line. Junior quarterback Jack Mousette (11-for-20, 82 yards, one touchdown) nearly connected with a receiver but a nice tackle forced the pass incomplete and Foxboro held on for the win. 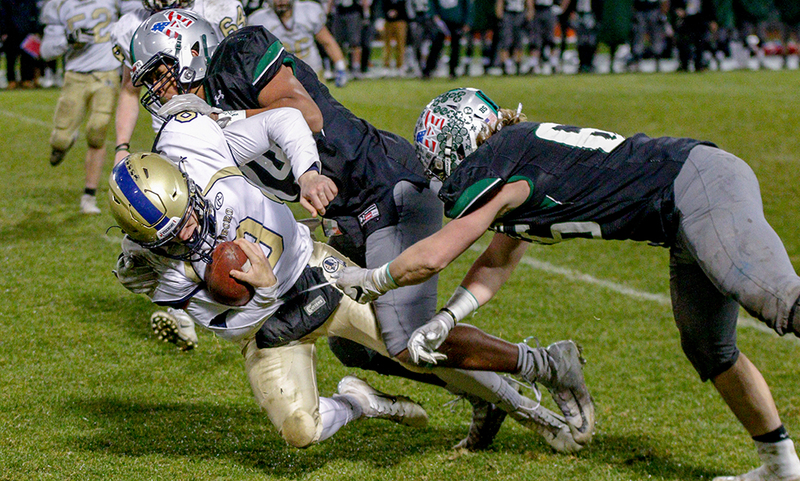 In the first overtime, Foley dodged some pressure to connect with Brian Derba for a 10-yard touchdown on third down but the two-point rush failed. Mansfield tied the game on its first play with Aidan Sacco (10 carries, 86 yards) using a QB option to keep it himself for a 10-yard score. After a delay of game, Mansfield’s two-point attempt from the 8-yard line was shut down. Foxboro had a chance to win it in the second overtime, but similar to Mansfield in the opening extra period, the defense came up big. Mansfield elected to pass on a 23-yard field goal (with starting kicker Michael DeBolt out hurt) and went for it on 4th and goal from the 6. Mousette hit Danny Rapoza right at the 1-yard line but Foxboro’s Shayne Kerrigan made a terrific leaping tackle to prevent the ball from crossing the goal line. Foxboro ran it twice before trotting its field goal unit out on third down for a 23-yard attempt. But Russell Neale’s attempt at a walk-off win at Fenway was denied by sophomore TJ Guy, who jumped high into the air and blocked the kick, leading to the third OT where Foxboro ended up winning. “I couldn’t have written a script any better for the seniors,” Martinelli said. “They were resilient, they hung tough. Even when it looked like momentum had swung a little bit, they came up and made some plays for us. I couldn’t be prouder of a bunch of kids than what I saw tonight. Before the teams got to overtime, Foxboro nearly had the game won in regulation. 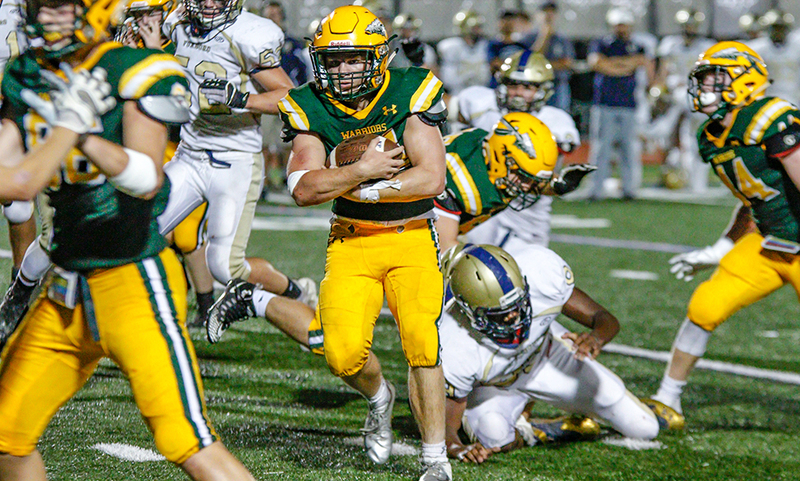 The Warriors stopped Mansfield inside the red zone (with the Hornet drive hampered by a bad snap and Pat Stapleton coming up with a big hit on fourth down) and had the chance to kill the block. Facing a 4th and inches from their own 40 yard line, Foley went back and tried to hand the ball off to each of his backs but instead pulled it back in for a bootleg run to the let side and converted. Three plays later, on a third and 9 play from the 43 yard line, Kerrigan came in motion and Foley faked the handoff on the jet sweep. The senior quarterback looked back to his right to get the defense to move in that direction and turned back to his left and lofted a pass to Kerrigan out on the sideline on a wheel route. Kerrigan did the rest, racing to a 57-yard score and a 21-13 lead with 2:32 to play. With just one timeout, Mansfield responded and marched 63 yards to tie the game. Joe Plath, who took over tailback duties with Vinnie Holmes, Michael DeBolt, and Nick Marciano sidelined and was named Hornet MVP, had an eight yard run to convert an early 4th and two from the Mansfield 45-yard line, and four plays later, with the Hornets staring at 4th and 7, Mousette used his legs to get 16 yards and a first. Another run from Plath on third down (3rd and 1 from the 19) got Mansfield inside the red zone with under 30 seconds to play. On third and goal from the 5 yard line, Mousette lofted one to Khristian Conner on the right side and Conner made a terrific catch while going to the ground for the touchdown. Mansfield went back to the ground for the two-point conversion with Gill taking the sweep left and cutting up the middle to tie the game 21-21 with just two seconds left. The Hornets took a 6-0 lead in the first half on a five-yard plunge from Plath, but had two turnovers in the opening frame to stop them from padding the lead. Hunter Williams forced an errant throw that Martin McIlroy hauled in for an interception and Anton George fell on a loose ball after a bad handoff exchange. Mike Sheehan had a fumble recovery in the second half for Foxboro. Foxboro tied the contest 6-6 on its opening drive of the second half. Foley orchestrated a nine-play, 78 yard drive that included a 40-yard pass and (terrific leaping) catch from Fay. Luong capped it with a 1-yard score. The game was tied for just 21 seconds though. On the first play of Mansfield’s ensuing drive, Sacco used a QB option to keep the ball and darted up the middle for a 68-yard score and a 13-6 lead after Gill hit the extra point. The Warriors pulled ahead early in the fourth quarter. Foxboro’s pass was incomplete on 4th and 4 from the six but Mansfield was whistled for offside, and then two straight unsportsmanlike conduct calls after that. Foxboro capitalized with Luong plunging in from 2 yards out. Luong also got the two-point conversion, albeit a little help from the offensive line with a big push after the Hornets had the original stop, to give Foxboro a 14-13 lead early in the fourth quarter. Foxboro football finishes the season 5-6 while Mansfield closes out the 2018 campaign with a 8-3 record. 1st Quarter: (N) Tyler Elliot 12-yard pass to Hunter Murphy, XP blocked; (F) Keyshawn Sanders 44-yard rush, Russell Neale XP good. 2nd Quarter: (F) Phil Thomas 36-yard pass to Shayne Kerrigan, R. Neale XP good. 3rd Quarter: (F) K. Sanders 2-yard rush, R. Neale XP good. 4th Quarter: (F) Mike Luong 5-yard rush, R. Neale XP good; (N) Nate Sicard 5-yard rush, 2pt conversion good. 1st Quarter: (A) Justin Cote 1-yard rush, XP failed; (BCH) Brendan Cassamajor 5-yard rush, #84 XP good; (BCH) Kaleb Moody interception return, XP good. 2nd Quarter: (BCH) Jacob Perez 40-yard rush, XP good; (BCH) K. Moody 34-yard rush, XP good. 3rd Quarter: (BCH) Bobby Wiesenhahn 2-yard rush, XP is good; (A) Jason Weir 24-yard pass to Alex Rodriguez, 2pt pass failed. 4th Quarter: (A) A. Rodriguez 14-yard rush, 2pt pass is no good; (BCH) B. Wiesenhahn 5-yard pass to Aidan Sullivan, XP failed; (A) J. Weir 11-yard pass to Justin Daniels, 2pt rush failed. #13 Franklin, 9 vs. #20 Durfee, 2 – Final – Franklin’s offense was nearly unstoppable in the first half, scoring seven goals in a big win over visiting Durfee in the playoff opener for both sides. Amanda Lewandowski scored four goals all in the first half as Franklin raced out to a 5-0 lead in the first 22 minutes. Ashley Reutlinger added two assists in a goal in the first half while Victoria Quinn finished with two goals, Cassi Ronan had two assists, Sara Carney had one helper, and Regan Paterson and Olivia Rondeau each scored once for the Panthers. Franklin advances to play #3 Notre Dame Academy in Hingham on Saturday at 4:00. #18 Taunton, 2 @ #15 Wellesley, 3 – Final – Taunton took a 1-0 lead in the game and were tied 1-1 at halftime, but Wellesley built a two-goal advantage in the second half. The Raiders scored the first two goals of the second half to go up 3-1 before Taunton made it a one-goal game. Alana Tavares and Cierra Bartel scored for Taunton, Caitlin Connors and Jillian Pagliuca each had an assist, and Emma Sheehan made seven saves in net. #1 Foxboro, 1 vs. #16 Falmouth, 0 – Final (2OT) – Foxboro senior Sophia DiCenso scored the game-winning goal 25 seconds into the second overtime to help the top-seeded Warriors advance to the D2 South quarterfinals. Foxboro will play the winner of #8 Cohasset vs. #9 Martha’s Vineyard on Sunday at 7:00 at Mansfield High School. Milford, 2 @ Sharon, 0 – Final – Milford senior Emily Haley scored her first career goal to help the Scarlet Hawks end the season on a high note. Junior Tatiana Martinez also scored in the win while Paige Reisman recorded the shutout in goal. #8 Oliver Ames, 3 vs. #9 Durfee, 0 – Final – Click here for a recap and photo gallery of this game. #10 North Attleboro, 1 @ #7 Brockton, 3 – Final – Click here for a recap and photo gallery of this game. #9 King Philip, 3 @ #8 Medford, 0 – Final – King Philip opened the postseason with a 3-0 sweep over Medford (25-14, 25-8, 25-10) Catherine Waldeck had 11 kills and a pair of blocks, Nicole Coughlan added five aces, six kills, two blocks, and 19 service points, and Shayla Weitzman chipped in with four aces, a kill, and 12 service points. KP will take on top-seeded Newton North (12-2) on Monday at 5:00 at Newton North High School. Game of the Week – Football – Click here for a recap and photo gallery of this game. 2nd Quarter: (T) Noah Leonard 8-yard pass to Wesner Charles, Coby Adams XP good; (T) N. Leonard 14-yard pass to Sean Quinlan, XP failed; (OA) Nathan Cabral 9-yard rush, XP failed. 3rd Quarter: (T) N. Leonard 26-yard pass to W. Charles, C. Adams XP good; (T) Josh Lopes 10-yard rush, C. Adams XP good. 4th Quarter: (T) C. Adams 21-yard field goal. 2nd Quarter: (KP) Ryan Halliday 16-yard rush, XP blocked; (A) Justin Cote XP block, Kevin Kevin Velazquez fumble return for 2pt conversion; (KP) Cole Baker 36-yard field goal. 3rd Quarter: (KP) C. Baker 27-yard field goal. Canton, 14 @ Milford, 12 – Final – Canton’s Brendan Albert blocked a field goal attempt as time expired to lift the Bulldogs to a win on the road. It was Albert’s second block of the game after he got his hands on an extra point attempt in the second quarter. 1st Quarter: (C) Johnny Hagan 29-yard pass to Kyle Fitzgerald, Owen Lehane XP good. 2nd Quarter: (M) Colby Pires 22-yard pass to Shapel Feaster, XP blocked. 3rd Quarter: (C) J. Hagan 41-yard pass to Ryan Lentol, O. Lehane XP good; (M) C. Pires 18-yard pass to S. Feaster , 2pt failed. 2nd Quarter: (F) Russell Neale 21-yard field goal. 3rd Quarter: (S) Jeff Grier 55-yard rush, Josh Cocchi XP good; (F) Mike Luong 2-yard rush, XP failed. 4th Quarter: (S) J. Grier 92-yard rush, 2pt failed; (F) Liam Foley 25-yard pass to Rob Fay, R. Neale XP good. Franklin, 6 @ Mansfield, 24 – Final – Click here for a Recap and Photo Gallery from this game. 1st Quarter: (M) Aidan Sacco 14-yard rush, Michael DeBolt XP good. 2nd Quarter: (M) M. DeBolt 35-yard field goal; (M) Vinnie Holmes 2-yard rush, M. DeBolt XP good. 4th Quarter: (M) Cincere Gill 46-yard rush, M. DeBolt XP good; (F) Nick Gordon 56-yard pass to Ryan Driscoll, 2-point conversion failed. Canton, 2 @ King Philip, 1 – Final – King Philip took the lead just over the midway point of the first half but Canton leveled before the break and scored a late winner to grab two points. Good pressure from Owen Teixeira led to chance for Nilaish Sen at the top of the box and he put the Warriors up 1-0. Canton’s Paolo Ruggeri leveled the score with just over five minutes left in the first half and senior Griffin Roach buried a free kick with just two minutes to play for the game-winner. Foxboro, 0 @ Oliver Ames, 2 – Final – Oliver Ames scored twice in the final 10 minutes to grab two points at home. Sophomore Colin Milliken scored the game-winner in the 72nd minute, finishing off a cross from classmate Jimmy Keane. Minutes later, sophomore Kevin Louhis converted a feed from senior Sean Flaherty. OA coach John Barata credited Matt Nikiciuk, Haendal Louhis, and Adam Freeman for strong play in the midfield and Harry Ahearn, Niko Byron, Aaron MacDonald and Matt Nosalek for their efforts defensively. Jacob Lerman, the OA senior goalie, earned his fourth shutout of the season. Stoughton, 2 @ Franklin, 3 – Final – Franklin built a 3-0 lead but had to hold off a furious Stoughton rally to beat the Knights. Stoughton used an own goal and a tally from John Neves (from Fabi Ponce de Leon) to get within a goal. The visitors nearly found the equalizer but Franklin’s defense was able to fend the Knights to get the win. Milford, 0 @ Mansfield, 1 – Final – Mansfield’s Luke Savoie converted a penalty kick in the 73rd minute to lead the Hornets to a win. In a very even game, both defensive units played very well. For Milford, Joey Madden, Zach Browne, Joao Boaventura, and Lucas Caetano kept the Hornets’ attack at bay. Mansfield’s Derek Meuth, Ethan Brill-Cass, Sam Nugent, and Cam Eddy were massive in earning the shutout. North Attleboro, 0 vs. Hingham, 0 – Final – A Hingham defender cleared the ball off the line, robbing North Attleboro of the best chance of the game as the Rocketeers and Harbormen finished level. Kyle Brier notched his fifth shutout of the season for the Big Red. King Philip, 8 @ Canton, 1 – Final – Canton took a lead inside the opening three minutes of the game, but the KP offense exploded for four goals before halftime and added four more after the break for a convincing win. Chloe Layne recorded a hat trick and Avery Snead had a brace and an assist to lead the Warriors. Jenny Cullen and Makayla Griffin each had a pair of assists, Ally Stanton scored a pair of goals, and Jaida Caruso scored once for KP. Oliver Ames, 1 @ Foxboro, 2 – Final – Foxboro scored in the final moments of the first half to tie the game, and found the winner halfway through the second half to beat Oliver Ames. “We battled the entire 80 minutes, I’m so proud of this team,” said Foxboro head coach Katie Stalcup. OA seized the lead in the 26th minute when Maeve Hogan scored off a corner kick from Brianna Gibson. Foxboro freshman Kaitryn Franchino leveled the match with three minutes left in the first half. Warrior sophomore Jordyn Collins scored the game-winner in the 23rd minute, finishing off a feed from Katelyn Mollica. OA head coach Britt Sellmayer added that Abby Hodges, Abby Evin, and Erin Holmberg played well for OA. Franklin, 9 @ Stoughton, 0 – Final – Emily Landry had two goals and an assist to lead the Panthers in a big win. Sydney St. Marie and Carly Alston each had a brace, Stella Regan added a goal and two assists, Anna Balkus had a goal and an assist, and Erin Quaile had a goal for Franklin. Sam Powderly, Kaylee DeSimone, and Calen Frongillo all had assists in the win. Nicole Weir had a strong game for the Black Knights. Mansfield, 2 @ Milford, 0 – Final – Steph Kemp and Katy Garvin scored second half goals to keep Mansfield unbeaten in the league. Kemp also had an assist, as did Maria Sevastos. Attleboro, 6 vs. Bishop Feehan, 2 – Final – Attleboro junior Anna Beck scored a hat trick to lead the Bombardiers over visiting Bishop Feehan. Alex Compton added a pair of goals and Eliza Sabilla scored once for Attleboro. Franklin, 1 vs. Needham, 7 – Final – Franklin’s Victoria Quinn scored in the first half on an assist from Cassi Ronan but the Panthers fell at home to Needham. Quinn’s goal had Franklin tied 1-1 at half with the Rockets but Needham’s offense exploded in the second half. Anna Jardine made four saves while Neilee Hess had one stop. Mansfield, 0 @ Bishop Feehan, 3 – Final – The Hornets pushed the Shamrocks to the brink but ultimately fell on the road 3-0 (17-25, 22-25, 29-31). “It was a great team effort and they worked really hard and played tough from beginning to end. I am really proud of their effort,” said Mansfield head coach Melissa Heeden. Greenly Kelly had 10 kills, Katie Dardinski had 13 service points and eight digs, and Sam Sternberg had 18 digs and eight service points for Mansfield. North Attleboro, 1 @ Taunton, 3 – Final – Taunton rallied after dropping the first set to the win the next three and get a win over the visiting Rocketeers, 3-1 (19-25, 25-23, 25-21, 25-16). Jaime Brown had a standout game, dishing out 32 assists along with four aces. Michaela Felici had a team-high 11 kills, Kamila Cuevas added nine kills, seven blocks, and three aces, and Sam Silviera chipped in with seven kills and four blocks. “It was a great team effort all around,” said THS head coach Toby Chaperon. For North Attleboro, Hayley Gaskin had 20 assists and Lauren Antonetti put down 10 kills. Oliver Ames, 3 vs. Brockton, 1 – Final – Oliver Ames defended its home court against the Boxers, taking the final two sets to earn a 3-1 win (25-23, 21-25, 25-22, 25-12). Junior Allison Barth had a strong game for the Tigers, finishing with seven kills. Sadie Homer added 30 digs and three aces, Jordan Bosse notched 13 kills and four assists, Caitlin Cavanaugh added 12 kills, and Allie Kemp (27) and Sarah Litwack (23) combined for 50 assists. Canton, 270 @ Foxboro, 273 – Final (6 cards) – Tied after four cards, and again after five, Canton prevailed on the sixth card to edge out Foxboro. Tommy Dimock earned match medalist honors, shooting a low round of 40. Thomas Singleton carded a 45 while Mike Gobbi, Mike Leonetti, and Andrew Middleton all shot 46. Conor Hunter’s 47 ended up being the difference for the Bulldogs. Charlie Baughan had the top score for Foxboro, shooting a 43. Matt Lathrop and Jon Dowling each shot 44 for the Warriors. Franklin, 249 @ Medway, 291 – Final – Franklin earned a win over Medway, who uses six cards for final scoring. Quinten Fero was the medalist, leading the way with a low-round of 38 for the Panthers. Jake Blaney, Matt D’Errico, and Jack Paterson each shot a 40 for Franklin. Mansfield, 161 @ North Attleboro, 155 – Final – North Attleboro’ Matt Wanless shot an even par round of 35 to pace the Rocketeers to an impressive win over Mansfield. Nathan Morreale had a two-over par round of 37 on the middle course at Heather Hill to lead Mansfield. WRENTHAM, Mass. – As King Philip’s new offense tries to get up, it’s going to need some help. On Friday night, that help came in the form of special teams. The Warriors leaned on a pair of good punt returns and their own punting game to win the field position battle, and as a result, a 17-0 verdict over visiting Foxboro. Three of King Philip’s seven drives started in Foxboro territory, and all three resulted in points. The other four resulted in three punts and the end of the game. King Philip’s defense had another strong showing after allowing just 14 points in the season-opening loss to North Attleboro. A sack from David Morganelli put a quick end to Foxboro’s first series. A 23-yard punt return from Tim Nault gave King Philip’s offense a strong start, first down at the Foxboro 36-yard line. The Warriors got one first down on a Jack Webster run up the middle, but a tackle for loss from Foxboro’s Anton George and Will Ogbebor put the hosts in a hole. KP quarterback Robbie Jarest (5-for-7, 32 yards) hit Morganelli (four catches, 35 yards) for an 11-yard gain but it was just short of the sticks. Junior Cole Baker drilled a 35-yard field goal to put the host Warriors ahead 3-0 with 4:05 left in the opening quarter. King Philip’s defense stymied the Foxboro offense again during the second series, including a sack from Webster. This time the punt was hauled in by Aidan Bender just over midfield, and he raced it 35 yards back to the Foxboro 28-yard line. Despite facing a 4th and 8, Jarest linked up with Morganelli for 11 yards to move the sticks. An offensive pass interference call moved the ball back at the end of the first quarter, but KP had an eight-yard scamper from Ryan Halliday (23 carries, 98 yards) and five more yards from Webster. On 3rd and 7, Jarest rolled out right and hit Morganelli, who dove down to the 1-yard line. On the next play, Halliday went up the middle for a 1-yard touchdown and a 10-0 lead with 9:09 to play in the first half. Foxboro responded with its best drive of the game, moving into King Philip territory. The Warriors ran 11 plays for 50 yards, highlighted by passes from Liam Foley (9-for-21, 84 yards) to Keyshawn Sanders (8 yards) and Brian Derba (5 yards). Foley hit Shayne Kerrigan over the middle for 20 yards to convert a third down. 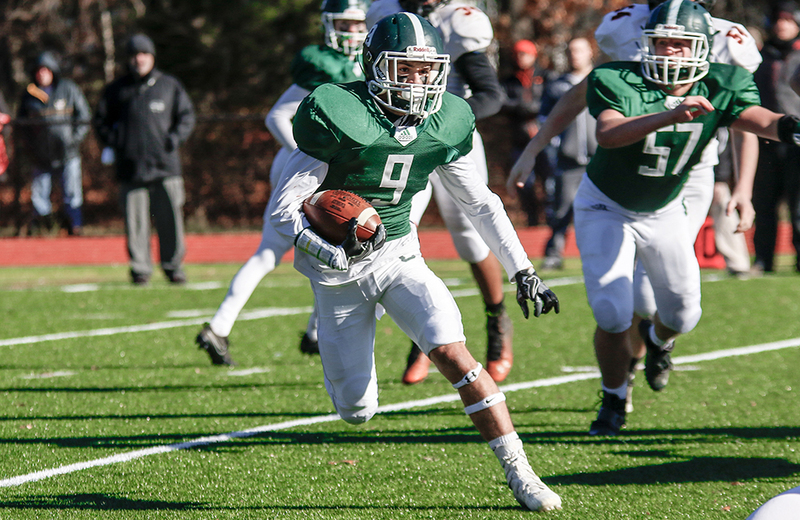 A 15-yard scramble from Foley gave Foxboro the ball at the King Philip 30-yard line but three plays later, King Philip’s Deric Casado tipped a pass and then came down with the interception to end Foxboro’s threat. Baker punted for KP when its drive stalled, booting to the Foxboro 30-yard line. With a long field to go, Foxboro’s drive ended near midfield when time ran out on the first half. Foxboro’s defense started the second half on a high note, forcing a punt. Again, Baker booted it to the Foxboro 30-yard line. Although Foley hit Pat Stapleton for 16 yards on the first play, a sack from Morganelli three plays later halted the drive. Although Foxboro’s defense came up with a stop, KP continued to win the field position with another strong punt from Baker (47 yards). King Philip’s defense pushed the visiting Warriors back even further with losses of six and three yards on the first two plays. On fourth down, Foxboro’s punt sailed out of bounds at its 36-yard line. Once again, King Philip cashed in on good field position. This time the host Warriors ran seven plays to cover 36 yards, capped by a 3-yard touchdown from Halliday, who had gallops of 12 and nine on the drive. Baker’s extra point put KP up 17-0 with 9:13 to play. After giving up just 14 points last week, King Philip’s defense had another strong outing. Foxboro had just 92 yards of offense and KP recorded four sacks and one interception. Foxboro (0-2) will try to break into the win column when it plays Stoughton (1-1) at Canton High School. Below are the official 2018 Hockomock League Boys Tennis All Stars, selected by the coaches in the league. #4 Mansfield, 11 @ #1 King Philip, 13 – Final – Click here for a recap and photo gallery of this game. 1st Quarter: (KP) Shane Frommer 6-yard rush, Cole Baker XP good. 2nd Quarter: (M) Damani Scott 1-yard rush, Mike DeBolt 2-point conversion rush; (KP) S. Frommer 10-yard rush, 2-point failed; (M) M. DeBolt 33-yard field goal. #4 Stoughton, 12 @ #1 North Attleboro, 35 – Final – Click here for a recap and photo gallery of this game. 1st Quarter: (NA) Chad Peterson 5-yard rush, Geoff Wilson XP good. 2nd Quarter: (NA) C. Peterson 3-yard rush, G. Wilson XP good; (S) Evan Gibb 41-yard pass to Ruben Gonzalez, XP failed; (NA) Nathan Pearce 16-yard rush, G. Wilson XP good. 3rd Quarter: (NA) C. Peterson 2-yard rush, G. Wilson XP good; (NA) Brendan McHugh 7-yard rush, G. Wilson XP good. 4th Quarter: (S) Justin Ly 11-yard rush, 2pt failed. 1st Quarter: (DY) Rob Evans 19-yard rush, 2pt conversion good; (DY) B. Evans 61-yard rush, XP good; (DY) Jonah Arsenault 5-yard rush, XP good. 2nd Quarter: (DY) Daryan Thompson 68-yard rush, XP good; (DY) J. Arsenault 6-yard rush, XP good; (DY) R. Evans 38-yard rush, XP good. 3rd Quarter: (F) Liam Foley 48-yard pass to Jake Addeche, Russell Neale XP good. 1st Quarter: (A) Alex Rodriguez 5-yard rush, 2pt conversion failed. 2nd Quarter: (NB) Tru Williams 7-yard pass to Edgar Semedo, 2pt conversion failed. 3rd Quarter: (A) Joseph Llanos 9-yard rush, XP failed; (NB) Baron Hilton 35-yard fumble return, Victor Lopez XP good. 4th Quarter: (A) Jason Weir 3-yard rush, Justin Cote 2pt pass to James Weir; (NB) T. Williams 39-yard pass to Kolby McCoy, 2pt conversion failed. 1st Quarter: (C) Alec Ragusa 8-yard rush, Owen Lehane XP good. 2nd Quarter: (C) Gersom Rivera 40-yard rush, XP no good; (M) Medway rush touchdown, 2pt conversion good; (C) G. Rivera 42-yard rush, 2pt failed. 3rd Quarter: (C) Kyle Fitzgerald 1-yard rush, O. Lehane XP good; (M) Medway rush touchdown, 2pt conversion good; (C) O. Lehane 32-yard field goal. 1st Quarter: (B) Braintree 69-yard rush, XP failed. 2nd Quarter: (F) Jake Noviello 20-yard pass to Will Davis, XP no good; (B) Braintree 6-yard pass, XP good. 3rd Quarter: (B) Braintree 19-yard pass, XP good; (F) J. Noviello 4-yard pass to Sean Leonard, Matt Zucco XP good. 4th Quarter: (B) Braintree 16-yard rush, XP good; (B) Braintree 38-yard rush, XP failed. 1st Quarter: (M) Ryan O’Toole 11 yard rush, Sean Lehane XP good. 2nd Quarter: (M) R. O’Toole 24 yard rush. S. Lehane XP good; (M) S. Lehane 28 yard field goal; (H) Holliston passing touchdown, XP no good; (M) Colby Pires 49-yard pass to Shapel Feaster, XP good. 3rd Quarter: (M) R. O’Toole 16-yard rush, XP failed; (M) Chris Rivera 40-yard interception return, XP failed. 2nd Quarter: (PS) Plymouth South passing touchdown, XP no good. 3rd Quarter: (PS) Plymouth South field goal good. 4th Quarter: (OA) Matt Berksza 10-yard rush, Derick Hanscom XP good; (OA) D. Hanscom 25-yard field goal. 1st Quarter: (S) Mitchell Director 24-yard field goal. 2nd Quarter: (S) Chris Gong 80-yard punt return, M. Director XP good; (W) Westwood 1-yard rush, XP good. 3rd Quarter: (W) Westwood 1-yard rush, XP good; (W) Westwood 60-yard punt return, XP good; (W) Westwood 12-yard pass, XP good. 4th Quarter: (W) Westwood 1-yard rush, XP good. #14 Franklin, 4 vs. #19 Brockton, 2 – Final – Click here for a recap of this game. #5 Foxboro, 2 vs. #12 Martha’s Vineyard, 1 – Final (OT) – Sophia DiCenso scored both goals for the defending Div. 2 South champions, including the game-winner 45 seconds into the overtime period to earn Foxboro the first round win. Katie Notarangelo assisted on the first goal and the Warriors advance to face No. 3 Dover-Sherborn on Sunday. 3rd Quarter: (A) Cam Furtado 2-yard pass to James Weir, 2-point rush failed. 1st Quarter: (B) Barnstable 31-yard rush, XP failed; (KP) Shane Frommer 1-yard rush, Cole Baker XP good. 2nd Quarter: (KP) S. Frommer 5-yard rush, C. Baker XP good; (B) Barnstable 27-yard pass, 2-point failed; (KP) Brendan Lydon 12-yard pass to Jack Piller, C. Baker XP good. 3rd Quarter: (KP) B. Lydon 22-yard pass to Tom Madden, C. Baker XP good. 4th Quarter: (B) Barnstable 5-yard pass, 2-point pass good; (KP) B. Lydon 5-yard pass to J. Piller, C. Baker XP good. 1st Quarter: (Mans) Damani Scott 6-yard pass to Hunter Ferreira, Michael DeBolt XP good. 2nd Quarter: (Mans) Vinnie Holmes 2-yard rush, D. DeBolt XP good; (Marsh) Jackson Phinney 14-yard pass to Danny Hickey, D. Hickey XP good. 3rd Quarter: (Mans) Nick Marciano 71-yard interception return, XP failed. 4th Quarter: (Mans) V. Holmes 13-yard rush, M. DeBolt XP good; (Mans) M. DeBolt 6-yard rush, M. DeBolt XP good; (Marsh) J. Phinney 31-yard pass to Nick Banks, D. Hickey XP good. #1 North Attleboro, 28 vs. #8 Walpole, 14 – Final – Click here for a Recap and Photo Gallery from this game. 2nd Quarter: (NA) Chad Peterson 8-yard pass to Nolan Buckley, Geoff Wilson XP good; (W) Brett Lavanchy 47-yard pass to Chase Conrad, XP no good; (NA) C. Peterson 26-yard pass to Devin Slaney, G. Wilson XP good. 3rd Quarter: (NA) C. Peterson 7-yard rush, G. Wilson XP good; (W) B. Lavanchy 16-yard pass to C. Conrad, B. Lavanchy to C. Conrad 2-point conversion. 4th Quarter: (NA) C. Peterson 8-yard rush, G. Wilson XP good. 1st Quarter: (WH) Ethan Phelps 8-yard pass to Jacob Nixon, XP good; (S) Justin Ly 50-yard rush, 2-point failed. 2nd Quarter: (WH) E. Phelps 8-yard rush, XP good; (S) Ruben Gonzalez 85-yard kickoff return, 2-point failed; (WH) E. Phelps 61-yard pass to Rian Schwede, XP good. 3rd Quarter: (S) J. Ly 2-yard rush, 2-point failed. 4th Quarter: (S) Johnny Medina 9-yard rush, 2-point failed; (S) David Bell 71-yard interception return, 2-point failed. 2nd Quarter: (D) John Roberts 4-yard pass to Frankie Tower, Ben Carver XP good. 3rd Quarter: (D) Duxbury safety. 4th Quarter: (M) Will Pointer 3-yard rush, Sean Lehane XP good. 1st Quarter: (F) Devin Hassett 6-yard rush, Russell Neale XP good; (F) D. Hassett 6-yard pass to Pat Carey, R. Neale XP good. 2nd Quarter: (SB) Steven Fralick 3-yard rush, XP failed; (F) Phil Dure 6-yard rush, R. Neale XP good. 3rd Quarter: (F) Anthony Capachietti 1-yard rush, R. Neale XP good. 4th Quarter: (F) A. Capachietti 5-yard rush, R. Neale XP good; (SB) Somerset-Berkley touchdown, XP failed. 1st Quarter: (C) Alec Ragusa 36-yard rush, XP failed; (PS) Alex Cohen 76-yard pass to Connor Holbrook, Emma Simpson XP good. 2nd Quarter: (PS) A. Cohen 9-yard pass to C. Holbrook, E. Simpson XP good. 4th Quarter: (PS) Brendan Shortall 3-yard rush, E. Simpson XP good. 1st Quarter: (F) Jake Noviello 18-yard pass to Sean Leonard, Matt Zucco XP good. 2nd Quarter: (F) J. Noviello 65-yard pass to Jake Davis, M. Zucco XP good; (F) J. Noviello 16-yard pass to S. Leonard, XP failed. 3rd Quarter: (F) Sean Hofferty 3-yard rush, XP failed; (W) Weymouth 10-yard pass, XP good; (W) Weymouth 5-yard rush, XP good. 1st Quarter: (OA) Cobey Williamson 46-yard rush, XP failed; (OA) Anthony Berksza 44-yard rush, Cam Perron 2-point pass to Noah Fitzgerald good. 2nd Quarter: (OA) A. Berksza 20-yard rush, Derick Hanscom XP good; (OA) C. Perron 10-yard pass to Ethan Eckstrom, D. Hanscom XP good. 3rd Quarter: (OA) A. Berskza 20-yard rush, D. Hanscom XP good. 4th Quarter: (N) T. Elliot touchdown pass to L. Combs, T. Elliot 2-point pass to C. Reynolds good; (OA) Nate Cabral 30-yard rush, D. Hanscom XP good. Stoughton, 0 @ Canton, 6 – Final – Canton junior Paul Corcoran scored four goals and also recorded an assist to help the Bulldogs roll to a big win at home. Griffin Roach and Paulo Ruggeri each scored once for Canton. King Philip, 1 @ Franklin, 1 – Final – King Philip senior Larsen Keys headed in a cross from Anthony Bozza in the final minutes of play to help the Warriors pick up a point on the road. Mansfield, 0 @ Oliver Ames, 0 – Final – Click here for a recap and photo gallery of this game. Milford, 2 @ Sharon, 1 – Final – Milford sophomore Nuno Mestre netted his first career goal, which turned out to be the game-winner, as Milford kept its postseason hopes alive. With the win, the Scarlet Hawks need one point from their season finale against Nipmuc. Sophomore Walisson de Oliveira opened the scoring midway through the first half, finishing a fed from Heitor Silva. Then Mestre converted a cross from Zach Brown midway through the season. Sharon scored its goal inside the final five minutes. Foxboro, 0 @ North Attleboro, 4 – Final – North Attleboro coach Bill Wallace earned his 200th career win as the Rocketeers got a brace from Leah Jette to earn the home win. Jette scored eight minutes into the game off a Kayla Pasquel assist and added a second off an Ashlyn Gaulin assist with 14 minutes to play. In between, Emma Gaulin scored on a Haley Guertin assist and Aine Mendonca added a goal early in the second half from a Julia Tolfa assist. Emma Noreck earned the clean sheet for North. King Philip, 3 @ Franklin, 0 – Final – King Philip’s Claire Lawler scored a pair of goals in the first half and set up the third to help KP cap its Hock schedule with a win on the road. Lawler scored on a corner with 9:25 to play in the first from Nicole Conner, and then scored with 2:39 left in the half, again on a corner, on a pass from Dana Truini. Liz Furfari iced the game, taking a feed from Lawler with 15:29 to play. Franklin junior Christina Luccini made 10 saves in net, including a stop on a penalty stroke. Oliver Ames, 0 @ West Bridgewater, 0 – Final – Oliver Ames senior goalie Caitlin Grant made seven totals, including three sliding saves to rob the hosts of find the back of the cage. Taunton, 1 @ New Bedford, 0 – Final – Taunton senior Liana Duarte scored the winner with five minutes left in the game, giving the Tigers their first postseason berth since 1990. Sophomore goalie Emma Sheehan made six saves for the shutout while interim head coach Mike Fox said Lauren Torres and Kennedy Thielker both had strong games defensively. Franklin, 3 vs. Bishop Feehan, 2 – Final – Franklin picked up wins in games one, three and five to edge off the visiting Shamrocks (25-17, 22-25, 25-21, 17-25, 15-13). Hailey Sanders and Meaghan Maguire each had eight kills apiece as well as two blocks, while Maggie Doyle chipped in with six kills and four blocks. Junior Lauren McGrath had 33 assists in the win, as well as four ace and two kills. North Attleboro, 3 @ Mansfield, 0 – Final – North Attleboro capped its regular season with a sweep on the road, and sixth straight victory in a row (25-14, 30-28, 25-14). For Mansfield, Meg Hill had nine kills and four blocks, Julia Harrison added eight kills and five digs and Lexi Gardner finished with five digs and four kills. Oliver Ames, 3 vs. Bridgewater-Raynham, 0 – Final – Oliver Ames defended home court with a clean 3-0 (25-8, 25-20, 25-12) sweep over the visiting Trojans. Senior Kayla Raymond had seven kills and three aces, junior Sarah Litwack notched 20 assists and seniors Katie Flynn and Emma Petrillo each added five kills apiece. 1st Quarter: (F) Jake Noviello 4-yard pass to Ryan Driscoll, XP blocked. 2nd Quarter: (A) Cam Furtado 11-yard pass to Justin Cote, C. Furtado 2pt rush. 3rd Quarter: (A) J. Cote 7-yard rush, C. Furtado 2pt rush; (A) C. Furtado 73-yard rush, Tyler Evans XP good; (A) Joseph Llanos 3-yard rush, T. Evans XP good. 4th Quarter: (F) J. Noviello 1-yard sneak, 2pt failed; (F) J. Noviello 22-yard pass to Evan Wendell, XP blocked; (A) J. Cote 30-yard rush, T. Evans XP good. 1st Quarter: (NA) Chad Peterson 4-yard pass to Jonathan James, Geoff Wilson XP good. 2nd Quarter: (NA) C. Peterson 31-yard pass to Mario Bresko, G. Wilson XP good; (NA) Nick Raneri 11-yard rush, G. Wilson XP good; (NA) C. Peterson 15-yard pass to Ryan Gaumond, G. Wilson XP good. 3rd Quarter: (NA) N. Raneri 1-yard rush, G. Wilson XP good; (C) Gersom Rivera 2-yard rush, Owen Lehane XP good. 4th Quarter: (C) Kyle Fitzgerald 2-yard rush, XP missed; (NA) Luke LaBonte 79-yard rush, G. Wilson XP good. 1st Quarter: (F) Mike Henri 5-yard rush, Russell Neale XP good. 2nd Quarter: (F) R. Neale 29-yard field goal good; (F) Devin Hassett 1-yard rush, R. Neale XP good. 3rd Quarter: (F) Phil Dure 9 yard rush, R. Neale XP good. 4th Quarter: (F) Keyshawn Sanders 1-yard rush, R. Neale XP good. 1st Quarter: (KP) Andrew Dittrich 44-yard interception return, Cole Baker XP good; (KP) Shane Frommer 10-yard rush, C. Baker XP good; (KP) Brendan Lydon 15-yard pass to Jack Piller, C. Baker XP good. 3rd Quarter: (KP) B. Lydon 25-yard pass to Dylan Leonard, C. Baker XP good. 4th Quarter: (KP) A. Dittrich 103-yard interception return, C. Baker; (T) Noah Leonard 20-yard pass to Wesner Charles, John Teixeira XP good. 1st Quarter: (M) Vinnie Holmes 4-yard rush, Michael DeBolt XP good; (M) Danny DeGirolamo 80-yard rush, M. DeBolt XP good; (M) Damani Scott 3-yard rush, M. DeBolt XP good. 2nd Quarter: (M) D. DeGirolamo 31-yard rush, M. DeBolt XP good; (OA) Anthony Berksza 1-yard rush, XP blocked; (M) D. Scott 39-yard pass to D. DeGirolamo, M. DeBolt XP good. 3rd Quarter: (M) Jordan Thevenot 2-yard rush, M. DeBolt XP good. Stoughton, 14 @ Milford, 3 – Final – Click here for a Recap and Photo Gallery from this game. 2nd Quarter: Justin Ly 25-yard rush, Josh Cocchi XP good. 3rd Quarter: Sean Lehane 46-yard field goal. 4th Quarter: Alex Sjoquist 3-yard rush, J. Cocchi XP good. Attleboro, 2 @ Oliver Ames, 0 – Final – Abigail Boudreau and Grace Mayer teamed up to create a pair of goals, helping the Bombardiers earn an upset on the road at OA. Boudreau scored on an assist from Mayer, and then the two combined to set up Kyra Lyons to make it 2-0. Shealyn Harrison earned her first career shutout in the win. Franklin, 7 @ Mansfield, 2 – Final – Junior Cassi Ronan registered four points to help the Panthers roll to a big win on the road. Ronan scored a pair of goals and set up two more in a win that qualified Franklin for the state tournament. Freshman Victoria Quinn netted a pair of goals while sophomores Erin Walsh and Olivia Mazukina and freshman Amanda Lewandowski each scored once. Taunton, 0 @ King Philip, 4 – Final – King Philip got off to a strong start, scoring a pair of goals inside the first five and a half minutes to take down Taunton. Dana Truini, Raegan Simeone (assisted by Caroline Klim) and Liz Furfari (assisted by Christina Hathaway) scored in the first half to help the Warriors build a 3-0 lead at the break. Nicole Connor scored with just over 12 minutes left to ice the game. Attleboro, 1 @ Mansfield, 3 – Final – Mansfield moved one step closer to an MIAA tournament berth with a win over visiting Attleboro (25-13, 25-16, 25-27, 25-20). The Hornets need to win two of their last three games to qualify. Meg Hill (16 kills) and Julia Harrison (15 kills, 12 service points) paced the offense while Greenly Kelly chipped in with seven kills for Mansfield. King Philip, 2 vs. Needham, 3 – Final – In a battle of two top teams, and in what could be a playoff preview, KP fell just short (25-21, 24-26, 25-21, 24-26, 15-17) to visiting Needham. Sydney Phillips had a standout performance, notching 29 kills and nine digs while Michaela Palumbo added 10 kills, nine service points, and three aces. Grace Ely chipped in with six kills, Julianne Rando had 11 digs and five service points and Kat Kmetz added 14 service points, five digs, two kills and two aces. Oliver Ames, 3 vs. Brockton, 2 – Final – Oliver Ames survived a marathon five-game thriller with visiting Brockton, prevailing 25-23, 24-26, 25-13, 19-25, 15-8. OAHS head coach Chelsea Cunningham said senior Emma Petrillo (12 kills, three aces, two blocks) was the player of the game. “She dominated the game offensively and executed at crucial moments in the game,” Cunningham said. Sophomore Allie Kemp added 22 assists and five aces, senior Kayla Raymond had 12 kills and three blocks, and junior Sadie Homer finished with 15 digs and a pair of aces.